For years, the conventional wisdom has dictated that diets rich in red meat, eggs or other high-fat foods worsens high blood pressure and heart disease. 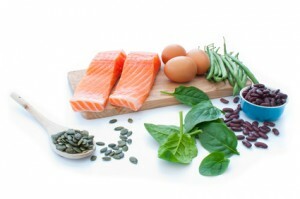 Now, the high-protein Paleo diet is thought to reduce the risk of developing high blood pressure. The diet, one of many high protein diets used for weight loss, focuses on eating lean meats, vegetables, and fruit and largely avoiding the processed grains – from bread to rice – that make up the bulk of the modern diet. Research from a new Boston University study published in the American Journal of Hypertension shows that high protein diets could have a positive effect on people who are at risk of developing high blood pressure. In the study, researchers carefully monitored the blood pressure readings of 1,361 people over more than 11 years and discovered that those with diets rich in protein typically had the lowest blood pressure scores. The protein-focused individuals consumed both animal and plant proteins and ate around 102 grams of protein per day on average. People that consumed a protein-based diet had an overall 40% reduced risk of developing hypertension. While many protein sources are ideal for optimal health, doctors and nutritionists warn against consuming large amounts of high-fat meats. The cut and type of meat can make a big different when it comes to health, particularly saturated far content.